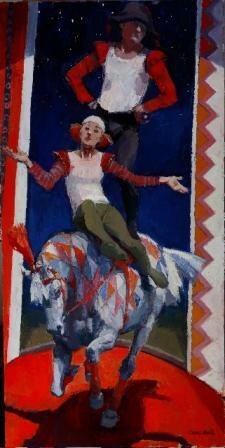 ''Equi-Librium'' shows the balance and poise of circus performers and their horse. Strong contrasts of colour, light and shade give depth and substance to the moment captured in this modern oil painting. Catriona Campbell has won a number of awards including the Founder''s Prize and the Anne Redpath Award from the Scottish Society of Women Artists, and the Morton Fraser Award from Visual Arts Scotland. She was elected a professional member of the Scottish Society of Women Artists (now re-named Visual Arts Scotland) in 1986 and subsequently a professional member of Paisley Art Institute. Artist Catriona Campbell is one of a growing number of artists whose modern art works feature at Red Rag Gallery in Bath. Modern art work from Catriona Campbell is regularly exhibited at the Bath art gallery which also offers an extensive choice of modern art, contemporary sculptures and collectible art prints from other present day artists.